Did you know that cabbage is the second most consumed vegetable in the world right after the potato? It’s that leafy vegetable that comes in both green and purple colors. French navigator Jacques Cartier first introduced cabbage to the Americas in 1536. Cabbage is also considered Russia’s national food.Did you also know that cabbage has more vitamin C than an orange does per serving? Note that red cabbage has more vitamin C than green, 57 mg versus 37 mg per 100 grams. It is high in vitamins K, C, B6 and is loaded with minerals like potassium, manganese and iron. One cup of cabbage provides you with 90% of the daily recommended allowance of vitamin K which helps your body fight against invaders and bacteria increasing your immune system strength defending you from sickness and disease. Cabbage is part of the cruciferous family of vegetables that also includes cauliflower, broccoli, brussels sprouts and bok choy which is the most popular vegetable in China. 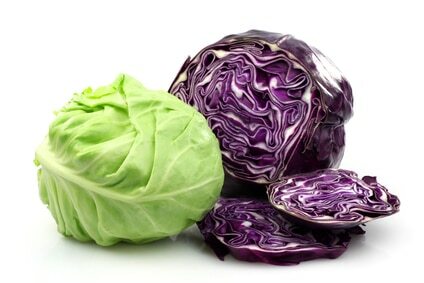 Cabbage is also known to purify the blood and removes toxins helping lower uric acid levels in your blood. In particular, red cabbage contains a flavonoid called cyanidin which also happens to be the most plentiful flavonoid in sweet and raw cherries as well as sour cherries at about 75mg per 100 grams! This makes red cabbage an important food in a gout diet. In addition, the anthocyanins that are found in red cabbage have strong anti-inflammatory compounds. It is high in amino acids and is believed to help those who are suffering from any type of inflammation. For gout sufferers who also suffer from diabetes, cabbage is extremely on the glycemic index and is also rich in fiber, soluble fiber that lowers the GI. Furthermore, some gout sufferers swear by using cabbage as a gout topical treatment by wrapping cabbage leaves around gout affected joints helps ease the pain. A popular method is to apply frozen cabbage leaves on the inflamed joint. An enzyme that is in the cabbage leaves helps get rid of the crystals that are nestled around the joint. Personally, I have never used this topical treatment to ease the pain of a gout attack. I do agree that you should try and incorporate red cabbage in your gout diet each week. A banana a day sure keeps the gout away! Haven’t had an attack in 18 months& eat just about everything,last week I had lobster Mon-hamburger &lamb chops during the week,Fri had a healthy dose oof brisket soaked in brine w/pepper corn seasoning &cabbage.Sunday my wrist started aching &Mon.am it was all swollen &hot. I eat the other foods pretty regular w/no problem.Do you think the brisket caused it? Yeah perhaps all that meat combined surged your uric acid and turned into a gout attack. Lay off the meat, remember to eat not more than 10% of your daily calories as outlined in my 80-10-10 gout diet. Is it true that tomatos cause gout flare ups? Please advise. Yes it’s considered a top 5 gout trigger amongst a recent poll of gout sufferers. What about oats? Some say they are OK,others avoid them,I am curious what Spiro thinks! The idea behind the Blood Type Diet created by naturopath Peter J. D’Adamo is a theory and not factual based on any conclusive studies. There isn’t any evidence that this type of dieting works so it’s not something I would follow. We have to avoid these fads and stick to the basics. You want to live long and be healthy? Talk to somebody who is 100 years old and over and you’ll quickly notice it is very close to the 80-10-10 diet which I did not invent and take no credit for whatsoever. It has been with us for us since the dawn of man. Our bodies are meant to live on a plant based diet which can be found everywhere and some meat. Thank you for all these great tips. Can a high protein diet trigger a gout attack? Yes of course it can! That is one of the main reasons people are diagnosed with gout every day. Due to their high protein diets that put a strain on the kidneys. Check out my other posts on this site to learn more. I never thought it would happen to me but I realized swollen feet were something more than I thought. The extraordinary thing is my body started CRAVING red cabbage and I never eat it because I have IBS. But the craving was so strong. Then I realized it was gout. The pain was horrendous but my dad suffered for years and I knew what to do. I actually made gross shakes out of red cabbage. I watched my diet and started walking even through the pain. Now I’m gout free and running a couple miles a day. What about cauliflower? I’ve heard it is high in purines? It’s fine, it’s a complex carb which your body breaks down rather easily compared to meat. Enjoy your cauliflower! I like mine steamed or raw. foods i cut- diet coke, deep fried, chicken wings, steak, bread, no sugar at all. Cauliflower are relatively high purine best in small servings like green beans, mushrooms, asparagus, spinach. I can see where wrapping a gouty toe with cabbage may reduce the inflammation as it works well for reducing breast engorgement in nursing mothers. I wouldn’t know about removing crystals but it would be worth trying.